How do government departments deal with their legacy estates and the need to reduce costs during times of austerity? On the anniversary of the last major financial crash, the same drivers for change have persisted in the UK Public Sector for the last 10 years, irrespective of political party in charge, whether an outright majority is held or whether we have decided to remain in or opt out of the European Community. These drivers are, 1) the need to reduce operational cost of service provision; 2) the need to react quickly to the dynamic nature of service demand and political necessities; and 3) the changing nature, level and way citizens and business want to be served. Globally, government agencies have reacted in many different ways to these demands, some more successfully than others. One added complication in the UK is the fact that the government and the service it provides has an enormous historical legacy to contend with. UK Government service provision started over 400 years ago with basic services such as defence of the realm and law and order. Service demand has increased to the point where some 40 per cent of GDP is now consumed in the provision of public service. In the UK the gradual evolution of service and provider has led to a complex set of organisations, processes and policies that make transformation difficult. If we had to start again, we would not choose to start from here! With such coverage and complexity, both the UK Government and technology industry that serves it has recognised the need for change. The efforts of UK Crown Commercial Services (CCS), with the assistance of Government Digital Services (GDS) should be lauded. The latter has had a major disruptive influence in the way government departments go about implementing new policies and procedures and have been strong advocates of the agile approach. 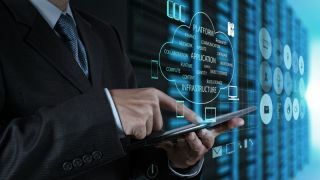 The former has introduced new procurement frameworks, such as G-Cloud. This has successfully reduced the procurement cycle by providing pre-negotiated terms and conditions, service definitions and prices for cloud based solutions and services use. Cloud based solutions for government is becoming the norm, at last! However, accelerated procurement only addresses part of the challenge. How do government departments deal with their legacy estates and the need to reduce costs during times of austerity? How do they deal with the ever increasing pace of change and different service demands from either politicians or constituents? Today’s constituents expect to interact with the government just as they would with their bank or online retailer, and expect a similar level of service. Agencies and systems integrators serving the government market typically have had two choices for modernising government operations, and neither of these has worked particularly well in the past. Custom development costs too much, and the application is obsolete by the time it is delivered. Lower-cost, commercial-off-the-shelf applications are inflexible and inadequate, forcing departments to wait for vendors to deliver what they need. Additionally, these solutions cannot be easily shared to cover both common and specialised delivery across agencies or geographies. One wonders how many applications independently contain the same constituent, benefit, or eligibility data. Multiple solutions then prevail with associated increased cost to implement, integrate, and support. The old adage, “re-use before buy before build,” still rings true but re-use is dependent on the solutions you currently have in place and the extent of the new solutions required as well as the funding available. To change solutions, wholesale is neither practical, because of the extent of risk involved with system, process, and organisational change, nor affordable. There is an alternative incremental approach that makes this possible – an enterprise platform. Systems of Record have their place in command and control situations but that’s not where public policy exists. Policy is constantly changing and Systems of Record are not the best option because the government’s needs are dynamic and susceptible to change. Custom solutions also have their place when the need is esoteric, however, as previously stated, they are not best placed to suit multiple changing needs in a cost effective way. Fortunately, there is a clear “best option” to build and manage your government applications: a Unified Enterprise Platform, and the G-Cloud 9 platform allows easy migration to this service. Not all application platforms are built the same and one must consider the time to value and the ability to change as policy evolves. Government has some real challenges to serve constituents as they expect and deserve. The key is to implement change incrementally using Unified Enterprise Platforms that can provide single solutions to meet multiple similar, but not identical, needs. These platforms exist but care must be taken to select one that is built using the latest IT capabilities available and that can easily adjust to future change. These capabilities will deliver efficiencies though self-service and case management, and an application that can keep pace with policy changes. By doing this, government can become proactive to constituent needs, offering “any door” to the services that they are entitled, making it easy for these to be claimed and delivered.